Something magical happened last night…. I saw Bruce Springsteen and the E Street Band live. I have always been a fan, but for some reason, seeing him live eluded me. That all changed on April 29th when he played the BB&T Arena in Sunrise, Florida. 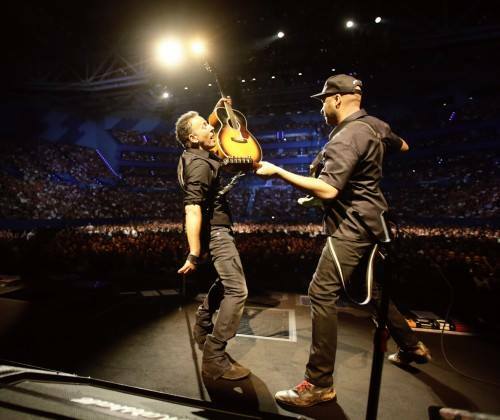 What made it even better… Tom Morello (Rage Against the Machine, Night Watchmen, Street Sweeper Social Club) took on the duties of lead guitar. The setup was very low production. No fancy sets, pyro or other concert wizardy. Just a flat stage (some levels) where many musicians practice their craft. The evening started with Bruce emerging onto the stage. “Are you ready to be transformed?” the Boss questioned the South Florida crowd as the band broke into the Clash song “Clampdown” and off we went on a tribal celebration of life expressed through music. 1) The sound was incredible. Ask anyone, the BB&T center is known for crappy acoustics. But this was different. The band was tight and every note could be heard perfectly clear. Every word Bruce said could be easily understood. Not sure if this is the product of touring for 40 years or some really good sound techs, but I was amazed at how good the music sounded. My heart was recalibrated by the primal drumming in “Shackled and Drawn”. 3) Bruce Springsteen is a great story teller. Yeah he talked a lot. And the audience hung… on…. every…. word. 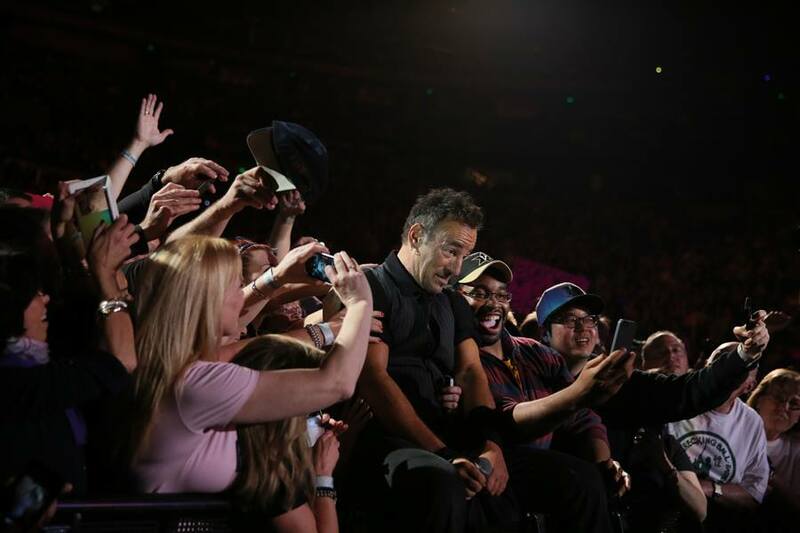 4) Bruce has no fear of his audience. He jumped off the stage frequently and walked around the floor playing his guitar. Lots of fan interaction. He made a lot of people feel special, including the lady who claimed to have been to 147 shows and was invited on stage to dance. What really impressed me is at one point, in the middle of the floor, Bruce did a trust fall backwards, was caught by the crowd who then passed Bruce OVER the audience halfway across the floor back on the stage. I was pretty impressed with his confidence and trust of his fans. 5) He takes song requests. There are many people holding posters on the floor with “song titles” or other messages (i.e. “Is your son available”). Bruce would collect these signs, pick one, show it his band who broke into a full performance of the song, except for “I want to Marry You” which Bruce performed by himself. I have never seen this kind of interaction between artist and audience and it was cool. 6) Clarence Clemons is no longer with us. But his nephew Jake is, and Jake rocks! The Big Man would be proud!!! Overall, an energy was tapped into that I have only felt on a few occasions. Where energy of band and crowd merge and that mixture creates something more than the sum of its original parts. I have experienced this with other super acts like U2, Pink Floyd, the Rolling Stones, Beastie Boys and again last night with Bruce and company. Did this surprise me? Not really. I had some pretty high expectations, and they lived up to each one. If you get a chance to see this show I would recommend it. You will leave transformed! Excellent. Saw him Saturday in Atlanta and will again Saturday at New Orleans. Shocked this was your first. I will have number 26 notched Saturday.